The Pyro AV Lens Support Bracket snaps onto standard 15mm rods using a thumb lever. This design enables you to attach the support to your rod system (not included) without first having to remove other rod-mounted accessories. Use the support to transfer the weight of the lens away from your camera's lens mount and to more evenly distribute the weight over the length of the rod system. The Pyro AV Lens Support features both vertical and horizontal adjustment to accommodate various lenses. 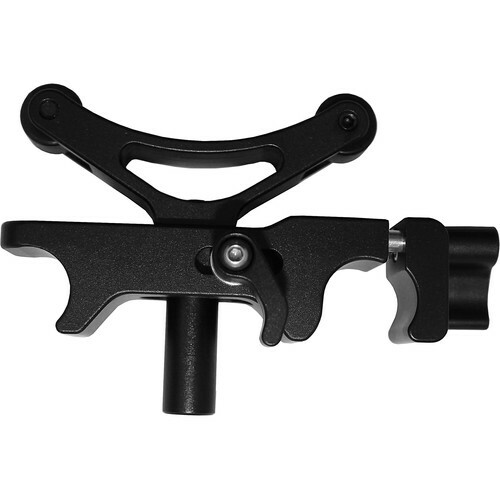 The Y-shaped lens support detaches from the rod mount for maximum configuration flexibility. The Pyro AV Lens Support Bracket is constructed from lightweight yet durable anodized aluminum. Box Dimensions (LxWxH) 4.9 x 3.1 x 1.0"